» Gifthulk Surveys Review – Is Gifthulk A Scam? Gifthulk Surveys Review – Is Gifthulk A Scam? 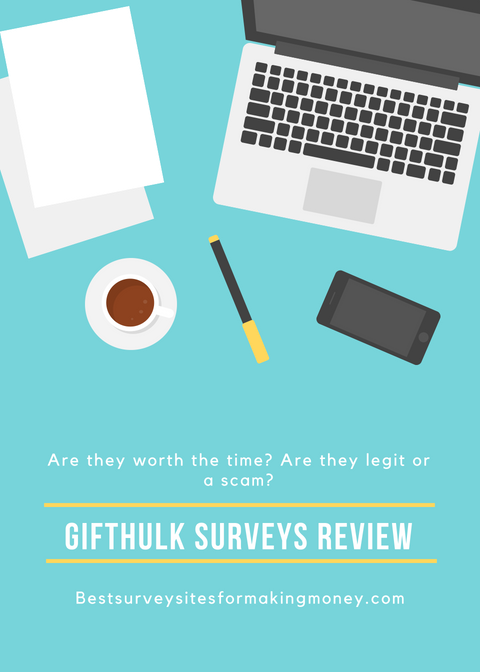 Welcome to my Gifthulk Surveys Review, in this post I'll be taking you through everything you need to know about them if you are considering joining them to earn money online. When it comes to making money online I have tried out many sites, half of which payout and the rest are either a scam or simply just not worth it. Among those sites you will find opportunities for you to make money by completing simple tasks, which is just what Gifthulk as on offer. I'm not going to go in depth just yet, however if you want to find out if Gifthulk is legit stick around until the end of this post to find out. If you are looking for a legitimate rewards site that pays well, don't look any further than my recommendation. They have helped me make an extra $500 every month ever since I first joined them! Gifthulk is a gpt site first founded in 2011 that pays people to complete simple tasks such as giving opinions in surveys, offers, watching videos and playing games. 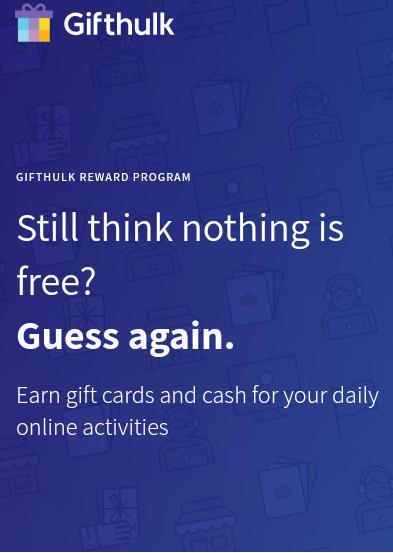 Effectively what Gifthulk as to offer is a quick way to make extra cash and recieve free rewards online, however its not exactly quick which you will find out in a second. This site is free to sign up for and supports countries consisting of the Australia, Canada, France, Germany, Ireland, New Zealand, UK and the US. Making an account takes a few minutes to do and can be done by going to their website at 'www.gifthulk.me'. You can sign up using either your Facebook or Google account or you can just use your email address, either one is fine. ​How Do You Start Making Money? For every task you complete you will recieve the site currency of hulk coins, similar to sites like Swagbucks, PrizeRebel who also have thier own kind of points system. Sometimes it can be confusing to follow, in this case for every 100 points you earn will equate to $1, so this one isn't so complicated. Completing Surveys - This involves you giving your opinions on different brands/products/services in return for a payout. Doing Offers - You can make money by doing various tasks such as signing up for trials, downloading apps and various other things. ​What Rewards Can You Redeem? Most of the gift cards are in the dollar ($) currency and for US retailers but you will also find payouts in other currency's such as sterling and Canadian dollars. Payouts are processed within 7 days of request, although if you are a high level member you can get priority and have your rewards sent sooner. This is a big issue in my opinion as if you are completing offers without an idea whether you are going to get paid is bad. You don't want your time going to waste and for you to just be completing surveys for nothing, but with many people not being paid out thier rewards it seems to be the case here. I never recommend sites that have a history of inconsistent payouts and I wouldn't change that now. So if you find sites that I personally recommend on this site that is because they have good payment systems in plan so you always know your going to receive your earnings. Gifthulk seem to offer plenty of opportunities to make money and if I was reading this review I wouldn't know where to start. I found though most things pay small and for the surveys themselves were hard to qualify for. With asite like this one you will be only earning a few dollars a month as thier isn't anything that great on offer and there much like most gpt sites out there. However with the last complaint I just spoke about it also seems like making a few dollars might not be possible. Considering all the negative feedback that I have seen around the company I wouldn't risk it by joining. A lot of the members are complaining because they aren't receiving the rewards they requested and in my opinion I just wouldn't join any panel that is having those kind of problems as their is no guarantee that you will get paid. Gifthulk maybe legit and may pay out its members but from what I have seen so far its not promising so I am not recommending them if you are looking to make extra cash online. While this site isn't great there are other alternatives similar to Gifthulk that have much better reputations and pay out every time. If you want to find out which sites I recommend and if you are looking to make some extra cash each month then check out these top rated sites here. Join Swagbucks for free and make extra cash today! They pay you to complete surveys, watch videos, search the web and much more. They have paid out over $160,000,000 in rewards in the last 10 years! Join Now & Receive $5 For Free! What do you think to my Gifthulk Surveys review? Had any positive/negative experiences with the site? Previous Post Qbord Surveys Review – Will They Help You Earn Money? Next Post Is PaidViewpoint Legit Or Just Another Time Waisting Scam?